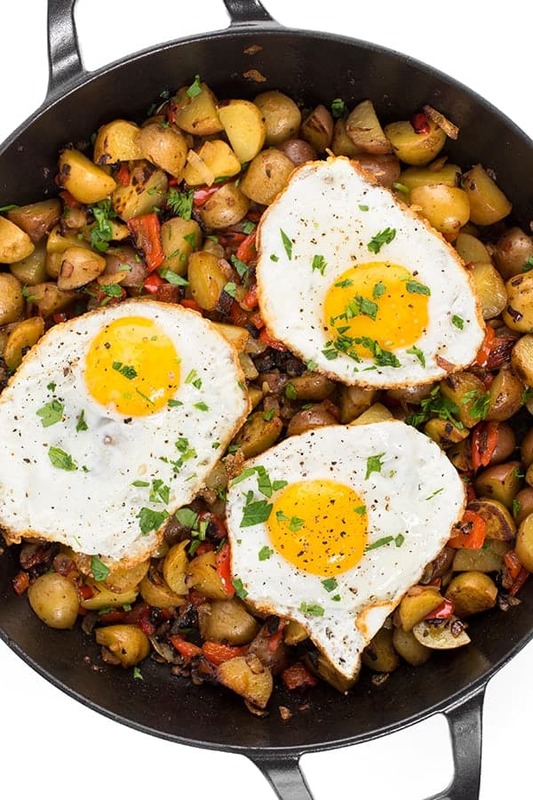 This hearty vegetarian hash breakfast skillet is packed with peppers, potatoes and onions then topped with protein-packed eggs cooked-to-order. 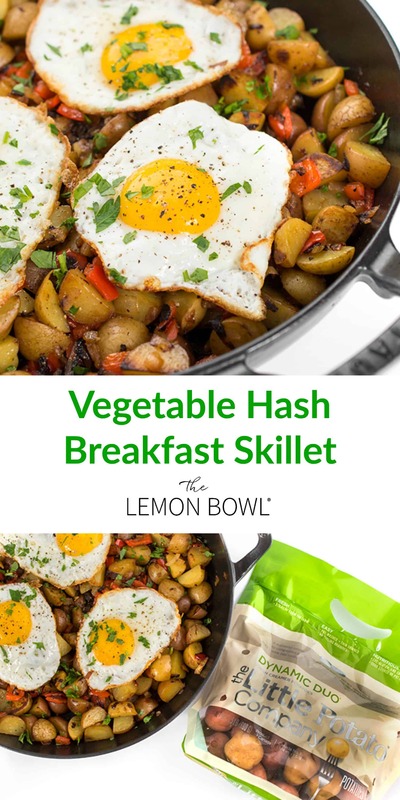 Whether I serve it for breakfast or dinner, a big skillet of vegetable hash is always a family favorite. Versatile, affordable and ready in under 20 minutes, you really can’t go wrong with this meal-in-a-pan. 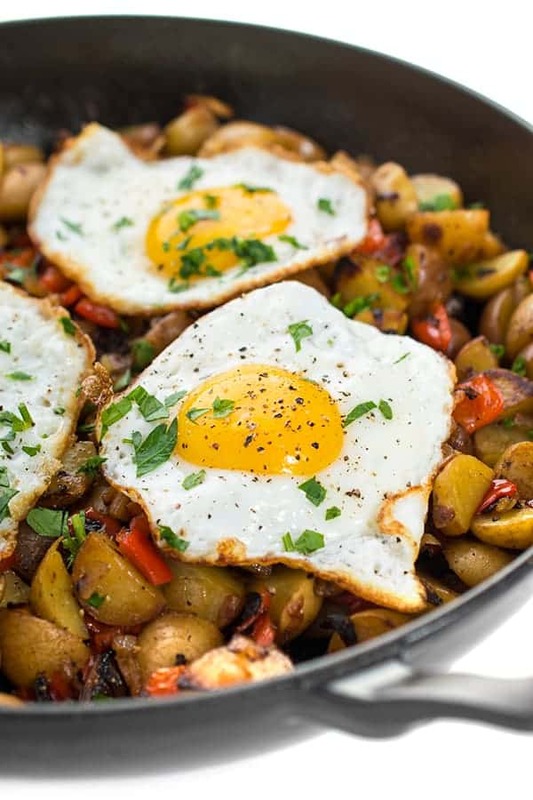 To start, you’ll want to cut around 24 Little Potatoes into bite-sized pieces. Depending on size, that means either halving or quartering them. 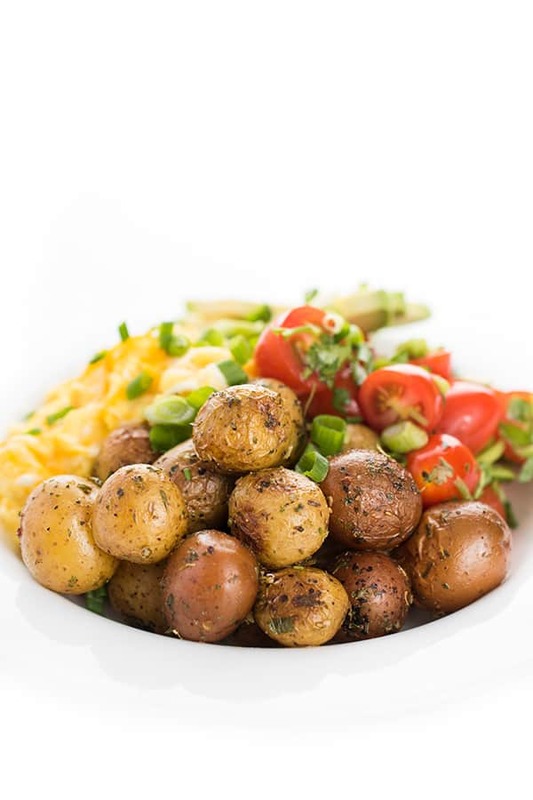 Quick Cooking Tip: To ensure even browning and caramelization, it’s a great idea to par-boil the potatoes about 3 minutes before sautéing them with the other veggies. Speaking of veggies, use whatever you have on hand! Onions and peppers are always in our kitchen but this dish would work great with shallots, Anaheim peppers, cherry tomatoes and more. 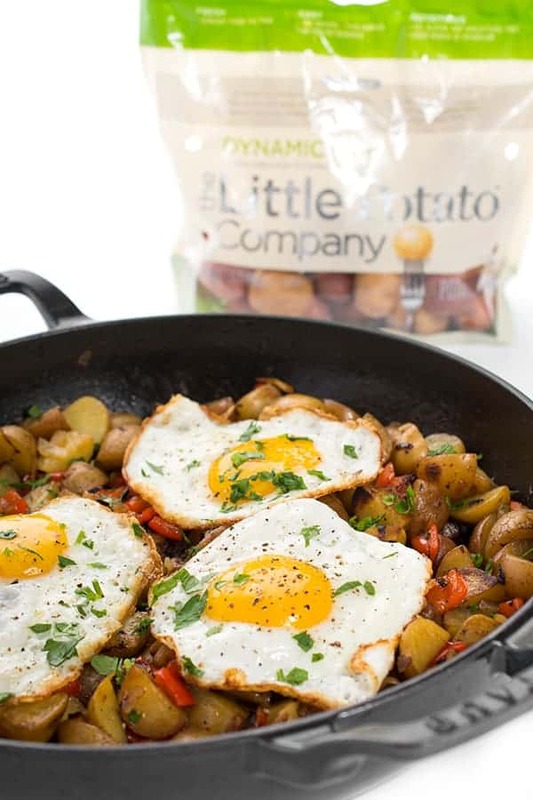 Our potatoes of choice for any breakfast hash is always Creamer potatoes from The Little Potato Company. The buttery flavor and creamy texture balances perfectly with the caramelized peppers and onions. Plus, they’re easy to use because you don’t have to peel them and they’re pre-washed. While the veggies are cooking, I like to cook my eggs-to-order in a separate frying pan. 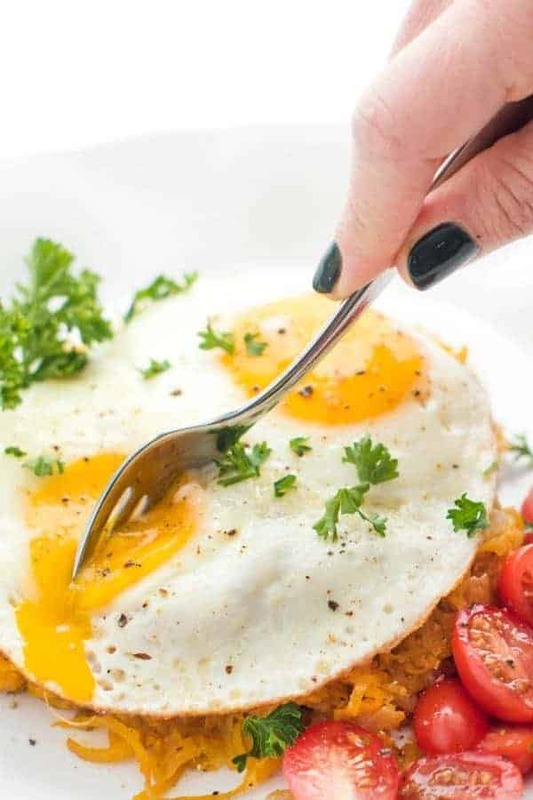 My kids like them sunny side up so that’s usually what we do but scrambled would be great too. 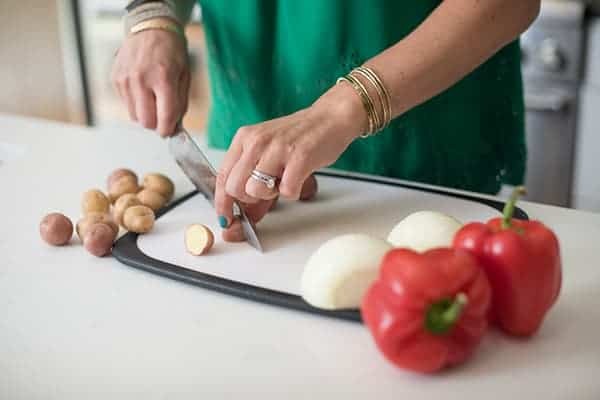 When you’re ready to enjoy, serve the skillet family style on the table. To brighten the flavors even more, sprinkle with fresh parsley right before serving. 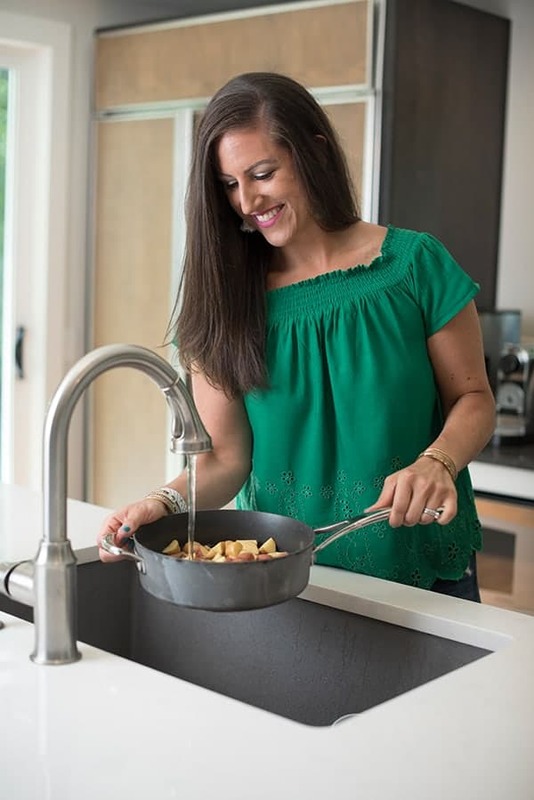 Place quartered potatoes in a shallow, deep skillet and cover with cold water. Heat pot over high heat and bring water to a boil. Reduce to low and simmer until potatoes are par-cooked, about 3 minutes; strain and set aside. Heat a large, deep skillet over medium high heat and drizzle with olive oil. Add onions to the pan and sauté until translucent, about 5-6 minutes. Sprinkle with salt and pepper to taste. Add diced peppers to the pan and continue sautéing until tender, about 4-5 minutes. Pour in par-boiled potatoes that have been drained and patted dry. Sprinkle with garlic powder, seasoned salt and cayenne. Continue sautéing until onions are almost caramelized, peppers are tender and potatoes are browned. 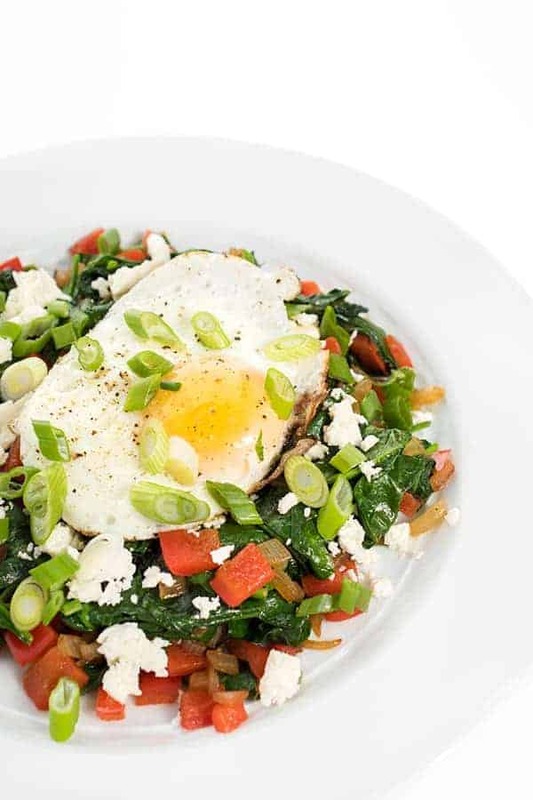 While the veggies are cooking, cook four eggs to order. 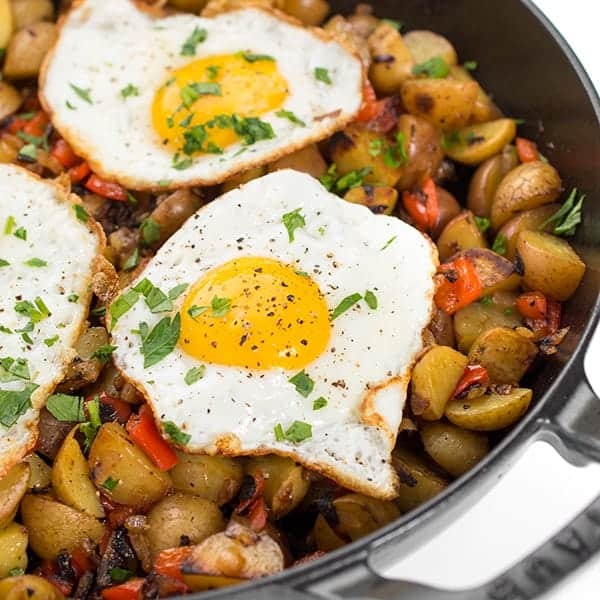 To serve, place the eggs on top of the veggie skillet and serve family style. 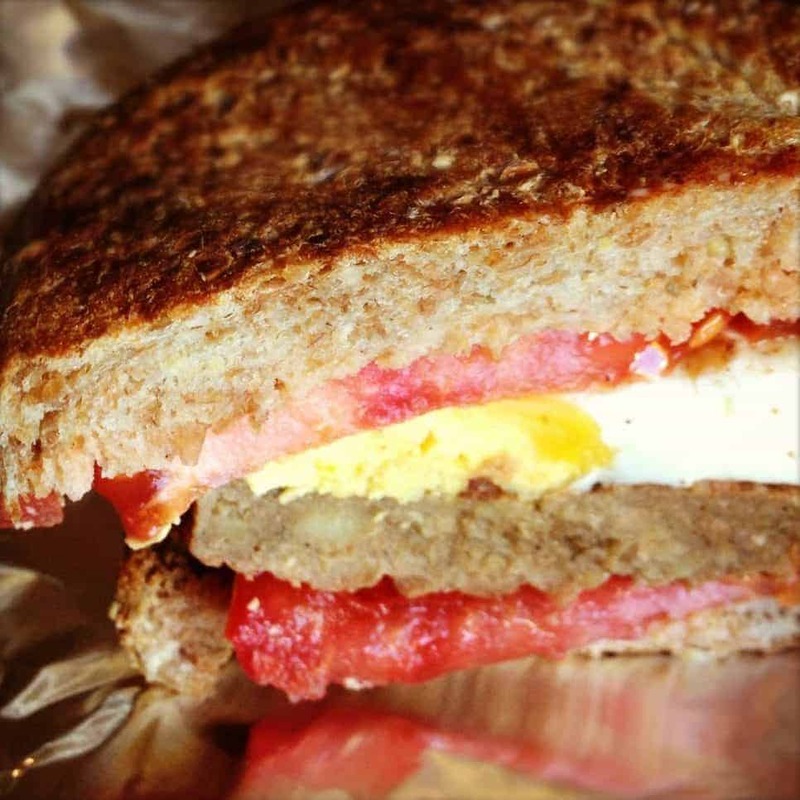 Want more hearty breakfast recipes? 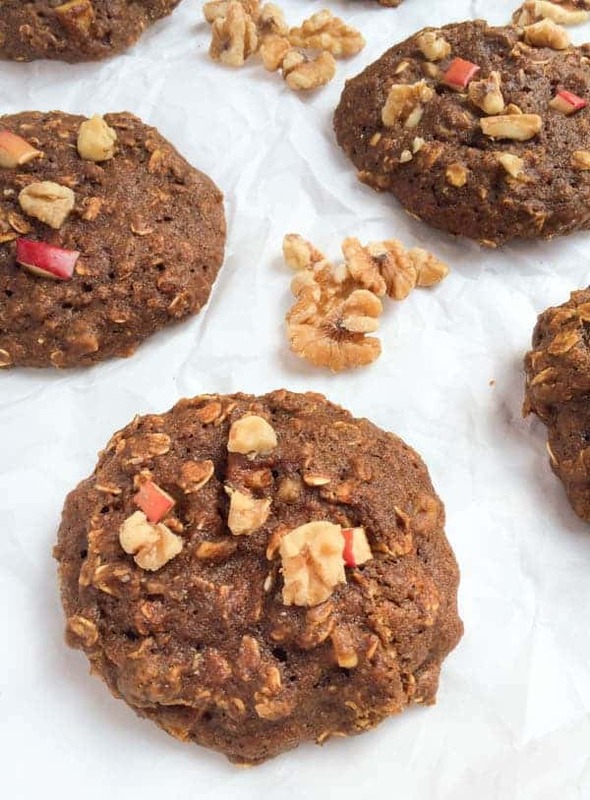 Head over to Pinterest! 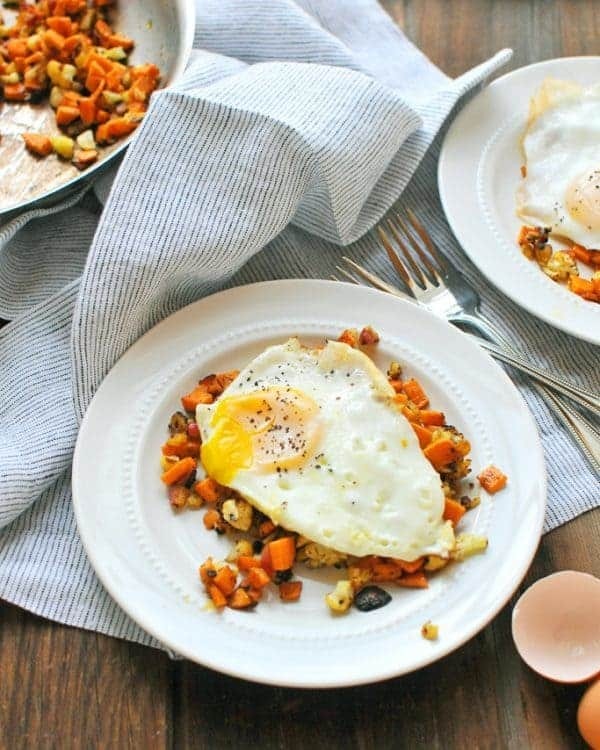 One of my favorite meals to make on our busy night is a hash! I have to try this recipe! I think your nutrition calculator has a glitch. 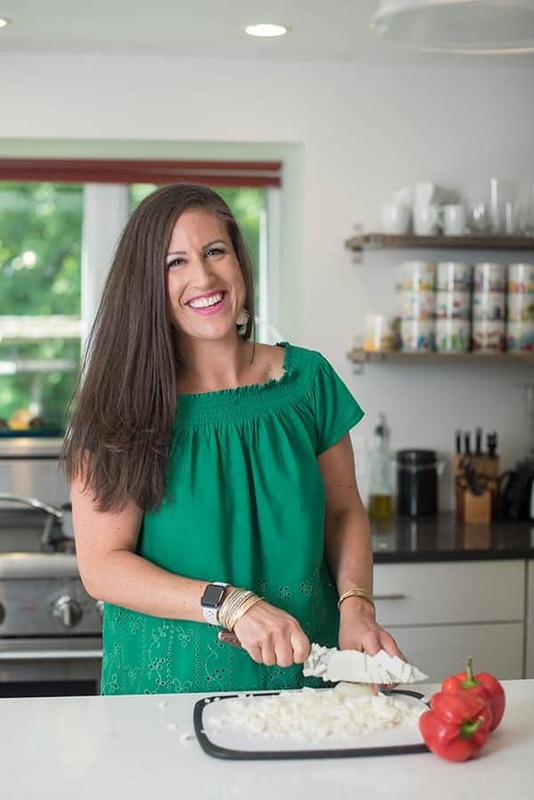 There’s no way a dish made of veggies and 1 Tbsp olive oil has 501 calories per serving with 26g of fat. Even when you add the egg. You’re right!! So sorry about that – we’ve revised the calculator and have been in touch with our developer to fix the glitch. Thanks again!